you might have noticed that I was very passionate about this film, – at least for a while. maybe it was because I saw an incredible visual potential, maybe because I was involved in it from so early on. but then it all stopped! 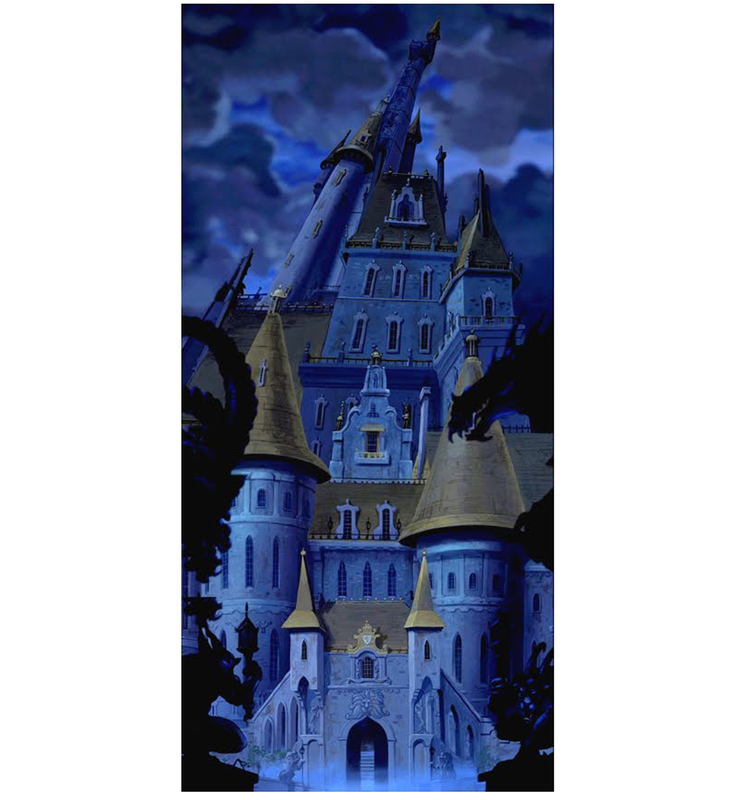 one morning during early production I saw the final design of the castle (you can see it below captured from the film) and quit. much later I watched the final film on a VHS cassette. the visuals were worse than what I had imagined! I am not even sure I made it all the way to the end. in this final chapter I show some film-stills, you judge yourself. anyway – that is just me, everybody else loves the film! so – if you wanna get a lot of information about it, then please check out CHARLES SOLOMON’S – TALE AS OLD AS TIME: THE ART AND MAKING OF BEAUTY AND THE BEAST, available august 31, 2010.
you are right, when I did a lot of them I was not aware that it will be a musical. in my oppinion it is a dramatic story with some comic relief. you have a similar approach in snow white. Well, I do love the film, but have to agree that it would have been much more powerful had it used the style reflected on the art you shown here. I do think the style is suitable for animation, and it would have been a richer film. Glen Keane’s Beast is strong enough to compensate for poor backgrounds and composition. 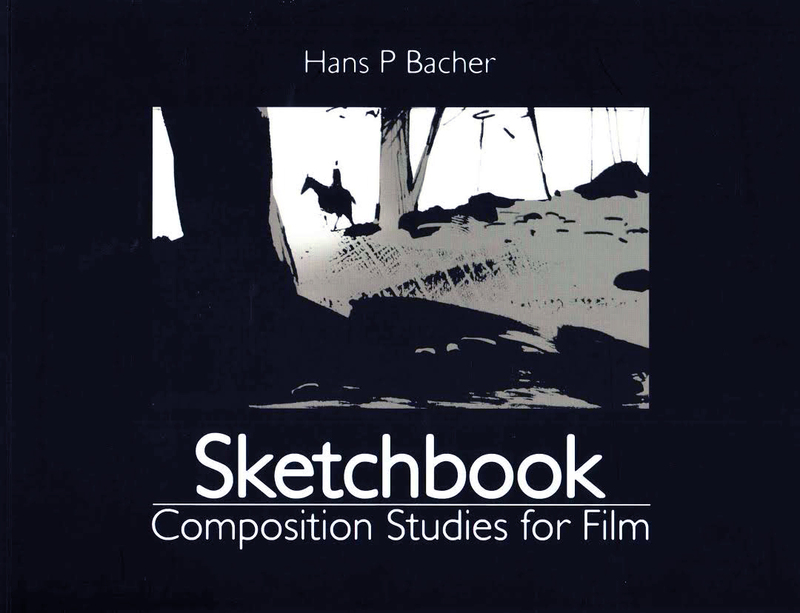 But in the end, it is still the movie that made me decide I wanted to be an animator. these BG have a childisch aspect but this naive approach is not unpleasant, popular but a rather cheap technique( the breakfast scene with the pink curtains is awful and unworthy of Disney). I think that your take on this movie is extremely beautiful and that the darker style could have made a better movie. I guess that Disney just isn’t the place for a darker take on fairy tales. Still, they could have used a more historical accurate design then the bubblegum-theme park style they ultimately went for. I saw Beauty in cinema and I don’t think I ever saw it again. It is a popular movie and if I’d see it now I’d probably like it. But I won’t enjoy it as much as looking at your designs and dreaming of the movie it could have been. Thanks for sharing! The final film is stunning, and the production designer, Brian McEntee did a FABULOUS job on the film. The early development stuff is cute and all, but barely holds a candle to the end result. One wonders why you’re complaining about the final film if you didn’t stay to put it up on the screen. After reading – in Dream Worlds – your account of your (and the whole pre-pro team’s) work on BATB, and RE-working things many times to please the folks in LA, I can understand that stinging feeling of disappointment. That at that point the talent of some of the most sought after animation and film artists couldn’t please a group of green-lighters would leave quite an awful taste in my mouth if that were me. Leaving that production after that only makes sense, even professionally – it’s exhausting being asked to push your creativity to the limits, only to be passed over for something entirely different at that scale. Not only does it make you feel like you were in the wrong the whole time, It’s just too much work for nothing at that point. I enjoyed this film as a kid, and there are still things that I enjoyed about it. But knowing more and more what it could have been is what illustrates the reality of the situation, and the disappointment. Thanks for still sharing all of your work for it though, Hans. thank you for your thoughts, jessica. that’s why I published the different chapters of a development of just one film. I want to document a development in the industry that happens all the time, you start with big hopes and enthusiasm and then after a while you wake up to reality. I guess there are not too many artists who can afford to react the way I usually reacted. it was risky and financially unsafe. but I always felt it was the only way to react against ‘the powers’. all of your work is, as usual, better than the final film. I was never a big fan of the film when it came out, but usually felt I should keep my mouth shut since so many people were so over the top about it. 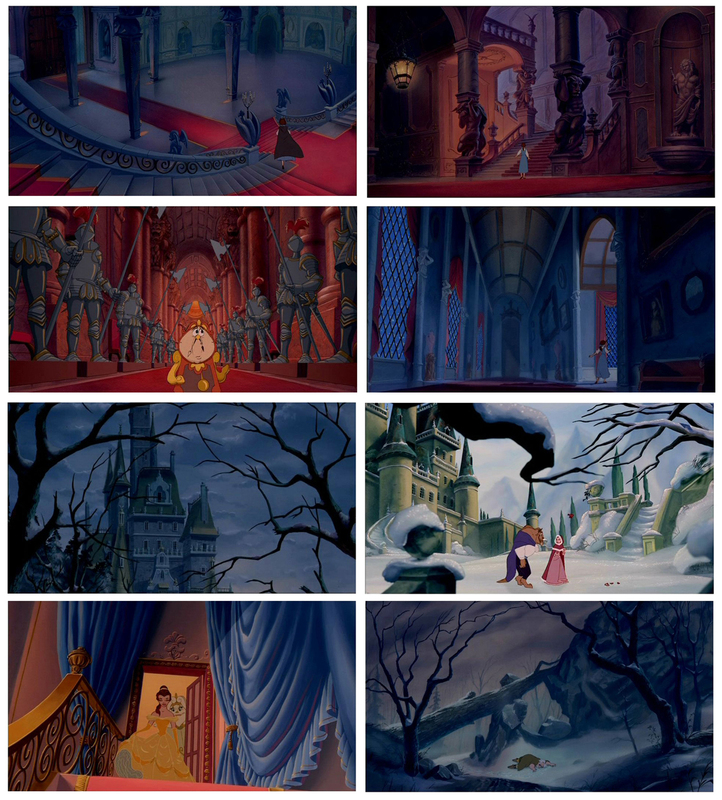 I did not like the backgrounds in the film and felt there was such a desperate attempt to make it feel like an older Disney film (Cinderella?) that it just didn’t stand on its own. Your designs are rich, original and beautiful The film needed the darkness you brought to these images. My primary complaint about the film had to do with the cutting. I just didn’t feel that it cut together well or was well organized. It felt like it was patched together. Having seen the film again, recently, (my companion directed a school production of the theater-piece and did her homework), I found that none of my opinions had changed. thank you, michael. 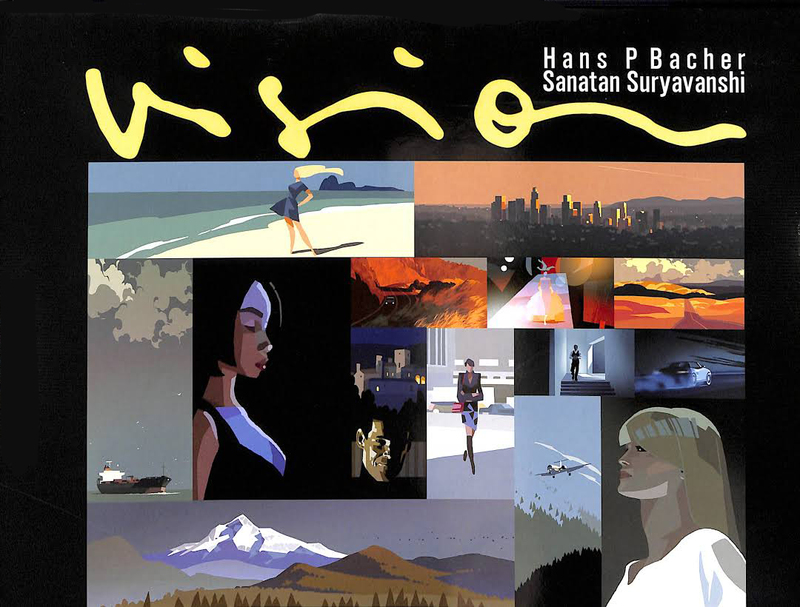 compared to the older masterpieces this film is just a bad caricature – no style at all, no feeling for the art, culture, architecture, nature and especially color and composition. I criticized a lot more of the more recent films, like fox and the hound, black cauldron and the little mermaid for the same reasons. in this case of beauty and the beast it hurt me more because I was a bit involved and had such big hopes. 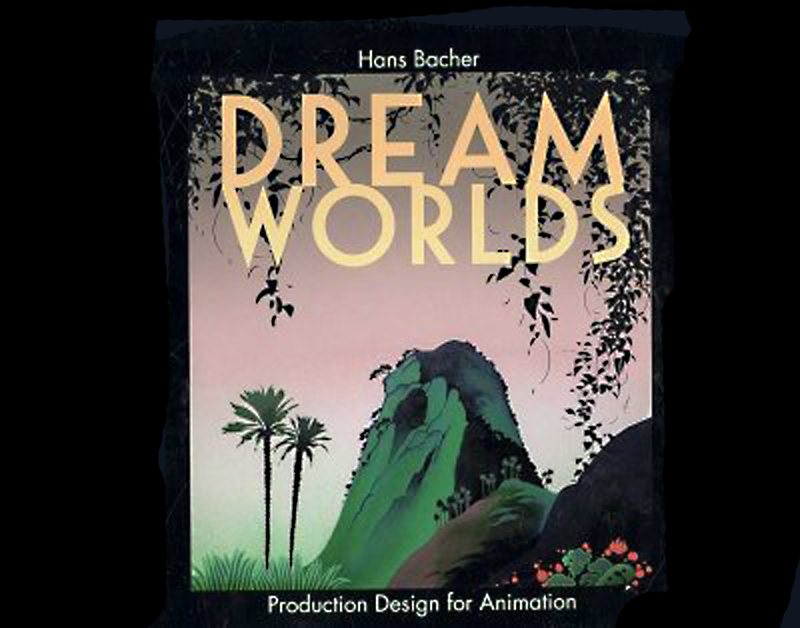 This seems to be a common theme in big animation productions: the development and pre-production artwork is always so much more imaginative and superior to what ends up on the screen. 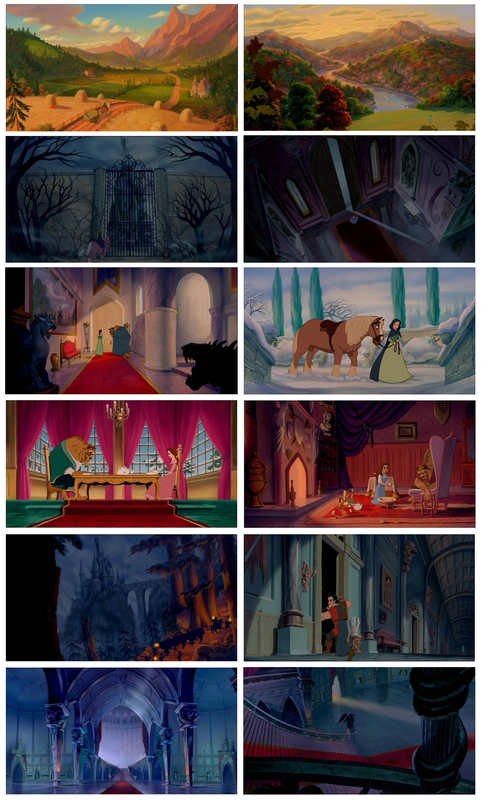 Your visuals for Beauty & the Beast are gorgeous; the colour and composition is so much more striking than what Disney put in the final film. I’ve never been a fan of this film, but I’ve always wondered if Disney took some of their inspiration from Jean Cocteau’s 1946 version of the film, even though they produced something so different! Unlike the old days, film making is controlled by businessmen, not by artists. A good example is Disney’s latest name change for Rapunzel. Can you think of anything more corporate? By the way, Hans. Are your digital brushes for sale? A lot of us here at the studio are painting digitally these days. worst movie at disney,colours,lay out….